Emerald, S. Y., 797 tons. Sir Christopher Furness. Was born in 1852 at West Hartlepool, and educated privately. He is owner of the steam turbine yacht Emerald, the first yacht of her type to cross the Atlantic. 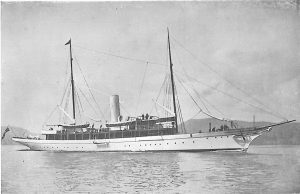 Commencing yachting in 1885, he first owned the Brantford, followed by the Meteor, Tunstall, and Onora. Residences: Grantley Hall, Ripon, Yorks; and 23, Upper Brook Street, London, W.